The recent storm brought with it a wet snow which is a whole lot heavier than the fluffy dry snow we're anticipating this weekend. KANSAS CITY, Mo. — The recent storm brought with it a wet snow which is a whole lot heavier than the fluffy dry snow we're anticipating this weekend. 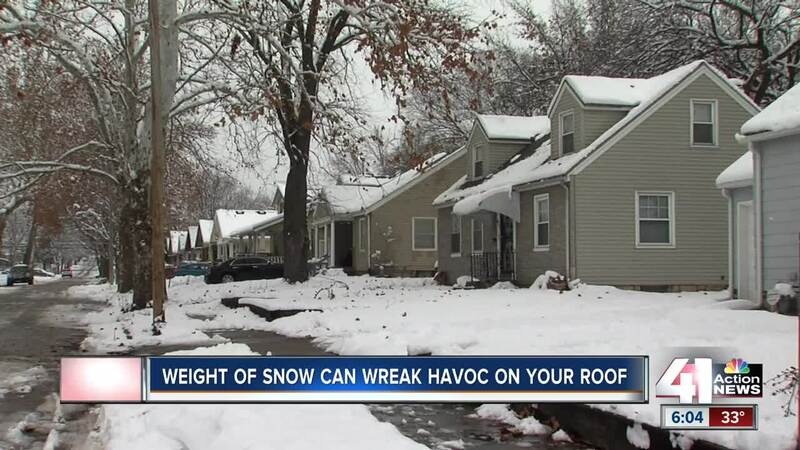 While a majority of homes built in Kansas City have sloped roofs, homeowners with flat roofs have to keep a close eye. Experts say it's going to hold more snow, it's going to take longer for the snow to melt and it's bearing down the load distribution of the weight. According to FEMA, the weight of one foot of fresh snow ranges from three pounds per square foot for light, dry snow to 21 pounds per square foot for wet, heavy snow. The owner of Easton Roofing, Joe Speicher, told 41 Action News prevention is key. Homeowners should have proper insulation in their attic and proper ventilation for the roof which will keep it from icing up and a lot of times that's what causes leaks. "We've had a lot of calls, a lot of leaks, branches falling on roofs. That's the number one issue a lot of times with storms like this. It starts to melt and it gets heavy and it freezes back up again and then you have even more limbs come down and when a limb hits your house it's going to cause damage," Speicher said. The one thing you don't want to get up on the roof yourselves, not only are you adding extra weight, you may injure yourself so make sure you call the professionals.